Love in general could be considered a “je ne sais quoi,” where you cannot find the proper words to describe it’s full potential. Added to the intangible qualities and emotions of humans, there are instances where a one-night stand’s beauty could be seen and felt due to it’s quality as being a one time occasion. 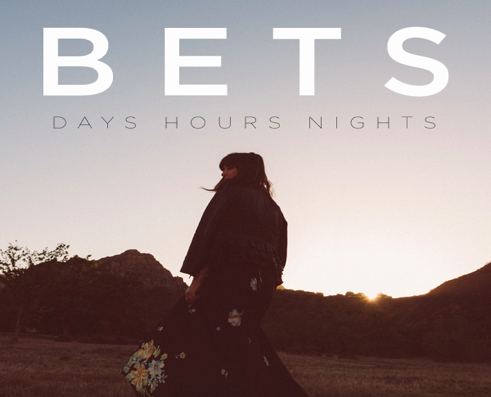 Bi-coastal, indie-pop artist BETS, touches on the subject with her single, “Jenny,” off her upcoming album Days Hours Nights, set to be released July 31st, narrates the inner thoughts about having a one-night stand, or “love affair,” in Paris with a girl named Jenny. The song’s light drift, and gentle sea breeze of inspiration, fuses pop elements into, what seems at first as a gentle love song. “Jenny” opens with a welcoming, warm invitation that could mirror the initial feeling of meeting someone, feeling those butterflies, and building to the passion quickly. BETS whisper, in vocal execution, delivers personal attachment in the song, that compliments the brightness of the overall track, and could lull the listener in love all over again. Yet, standing alone the song could be felt one way versus when watching the video, which was directed by Andrew Brooke. Shot in black and white, and opening up with two girls playfully dancing, played by Jade Lennes and Camille Ninat, leads back to BETS singing, as she begins to tell the story which soon unravels with the two girls. Innocence is captured beautifully by Lennes and Ninat, along with the clever direction of the video that lines up with BETS’ lyrics. Throughout the video the intimacy escalates and fools the viewer that this could possibly be only one night. Shots of BETS facial reaction in correlation to certain lyrics, stand out, and effortlessly make one-night stands a beautiful event.